As global economic foundations continue to crack and crumble, this sort of thing is just gonna happen…again and again. War, war, and more war. Enemies here, there, and everywhere. Just prior to Mitt Romney’s glorious Washington Post op-ed on Thursday, in which he called for a New World Order in which American military muscle was bulked up and ever-ready to press the globalist interests of the modern American Orwellian State, we were treated to a nice little bit of pre-game warm up courtesy of British Prime Minister David Cameron. As reported in The Guardian, British Prime Minister David Cameron earlier in the week warned [*cough*] “the free world” of the parallels between modern day Russia and Nazi Germany of the late 30s. “We run the risk of repeating the mistakes made in Munich in 38. We cannot know what will happen next. This time we cannot meet Putin’s demands. He has already taken Crimea and we cannot allow him to take the whole country,” said Cameron. So there we have it. Again. 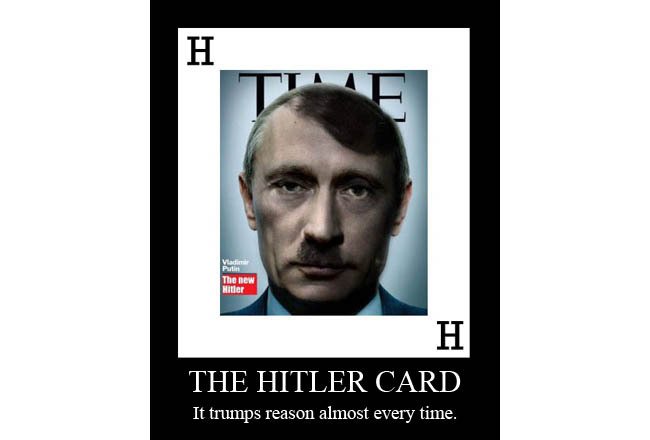 You could see and smell it coming a mile more away: The Hitler Card. Now we have to get ready for another war (again)! I mean, you wouldn’t want to be on the side of appeasing “another Hitler”, now would ya? So lemme get this straight: We (the West; or the corporate/banking powers that currently control the West, anyway) overthrow the duly, democratically elected government of Ukraine so that we can install our hand-picked, pro-globalist Ukrainian “government”, all right on the border of Russia, and then we act as though they are being “Hitleresque” when they move to secure their long-held interests on their own border? How would we feel if Russia did the same thing in Mexico? Oh wait, our own Corporate/Globalist leaders are kinda doing that to us already, aren’t they? It’s as though “we the people” are being led along by the nose through blind devotion and patriotism to accomplish the very things we claim to oppose most. Weird how that happens when you abandon Christ and His Word as the guide for your economics and politics, huh? It’s entirely predictable, actually…like the globalists’ routine use of the Hitler Card, the Race Card, and the Do It For The Children Card as needed. Globalists of all stripes love to yank us along their path with the Race Card, the Hitler Card, and the Do-It-For-The-Children Card. To understand why these things are being purposefully done by the powers that have seized control of our government, please read Problem>Reaction>Solution: Why we will beg to have our freedoms taken away and go to war forever. May God grace His people in America with the repentance and restoration required to save us from the evil we’ve enabled for so very, very long.